Simply put, a hernia occurs any time that an internal body part pushes into an area that it shouldn't. Although hernias can technically develop anywhere, they most often occur in the abdomen. In this case, the abdominal lining ruptures, and a portion of the soft tissue beneath — usually the intestines — protrudes through. The rupture can either be caused by normal wear and tear and physical stress, called an acquired hernia, or by a weakness present from birth, called a congenital hernia. In either case, the hernia can grow larger and more painful over time and during strenuous physical activity. Often, a hernia will make itself known. You might notice a bulge, pain, or swelling in the abdominal area, or experience pain or a heavy sensation while lifting, coughing, or bending over. Pain can range from sharp and sudden to a dull ache, and will usually hit near the end of the day or after periods of extended standing. Some hernias, however, do not cause any symptoms, and will only be noticed by your doctor during a routine checkup. The first stage of an abdominal hernia is a weakened and torn abdominal wall. The weakened area then begins to form a hernia sac, which can contain fat, tissue, or a small amount of intestine. Soon, the intestine begins to push further and further into the sac, forming a noticeable bulge. Usually, the bulge will flatten out when you lie down and can be pushed back behind the abdominal wall. After this point, the condition can become complicated, as the intestine may become trapped inside the sac, and will not be able to be pushed back in. When this happens, the intestine may be trapped so tightly that it becomes strangulated. The trapped area starts to lose blood and, if left untreated, may die, causing intense pain and a blocked intestine. This requires emergency surgery. If your hernia is small and not causing you pain, your doctor might recommend waiting and monitoring it closely before seeking treatment. If your hernia is growing or causing you pain, however, it should be treated promptly to avoid any serious complications. Hernia surgery can be performed in a number of ways. The hernia can be repaired using a mesh patch that is surgically placed over the tear and supported by nearby tissue. Additionally, a mesh plug can be used to fill in the hole that has formed in the abdominal wall. A combination device uses a mesh patch on both sides (front and back) of the abdominal wall, supported in the middle by a mesh bridge that rests inside the abdominal hole. This surgery can be done using laparoscopic surgery. This allows your surgeon to repair your hernia without performing open surgery, which can be more invasive and require a longer recovery time and more scarring. 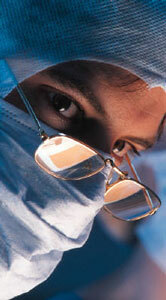 Your surgeon will tell you which of your regular medications you can take the morning of the surgery. You may be asked to stop taking aspirin or other medications that can reduce blood clotting. The night before your surgery your surgeon may tell you not to eat or drink past a certain time. The day of the surgery you may be asked to take a laxative so your intestines are empty. Most hernia surgery patients are able to leave the hospital as soon as they can eat, drink, urinate, and walk properly. You will likely be given pain medication immediately following surgery and have an IV tube in your arm for a few hours. Once you return home, you will need to limit your activity and avoid heavy lifting. If you feel comfortable, light exercise such as walking can improve your circulation and promote healing. Be sure to start eating a diet that is high in fiber and liquids. You may want to speak to your doctor about a stool softener if you experience constipation. You should be able to return to work within a few days for office jobs and two weeks for more physically demanding jobs, per your doctor's advice.